Tara Arts’ vivid production of Macbeth is a full-bodied rollercoaster of bloody passion. Jatinder Verma transports Shakespeare’s cut-throat tale into the home of an extended Indian family. It’s a clever idea, but what comes across more clearly in his production is a sense that these feuds, fatal as they are, are the domain of the rich, upper classes with the tragedy coming when the blood begins to filter down to the innocents of the castle. This is due in no small part to the delightfully detailed and not a little daft performance by a sparkling Shalini Peiris as the porter and servant. Verma’s decision to make the witches three transgendered Hijras adds a welcome dose of macabre comedy to the proceedings. Rax Timyr’s live percussion performance – a gorgeous, beat boxing and drum score – cleverly punctuates the action and mingles a cinematic feel to the heightened sense of theatricality. Kali Chandrasegaram’s choreography is stylish and otherworldly, while Kevin McCurdy’s fight sequences prove genuinely breathtaking. 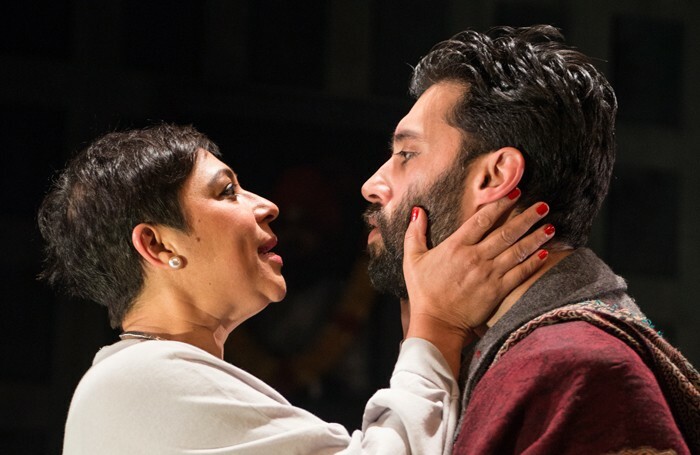 Against this vibrant backdrop, Robert Mountford and Shaheen Khan as Macbeth and his wife find it hard to match up, giving performances that are smoother than they are substantial. This is more Macbeth as thrill ride than piercing psychological thriller. But when it’s this much fun, you don’t mind.